The other evening Tim and I went for a stroll. I no doubt needed a power walk. But, I can’t leave home without my camera and then that power walk ends up becoming a stroll. Yes, I married a man who has incredible patience with me and my camera. On this particular night I came across these lovely yellow wildflowers. I haven’t yet discovered what they are. I think they might be a variety of Coreopsis. Do you know? As I was going through my photographs this stunning bit of yellow inspired this post. Years ago my dear friend Kaye gave me a book, Creating a Beautiful Home, about decorating written by Alexandra Stoddard. In the book she suggested that every room needs a bit of yellow. At the very least we can fill a bowl or basket with bright yellow lemons. I’ve never forgotten that suggestion. A bit of yellow really does give life to a room. Yellow really does make our world come alive! 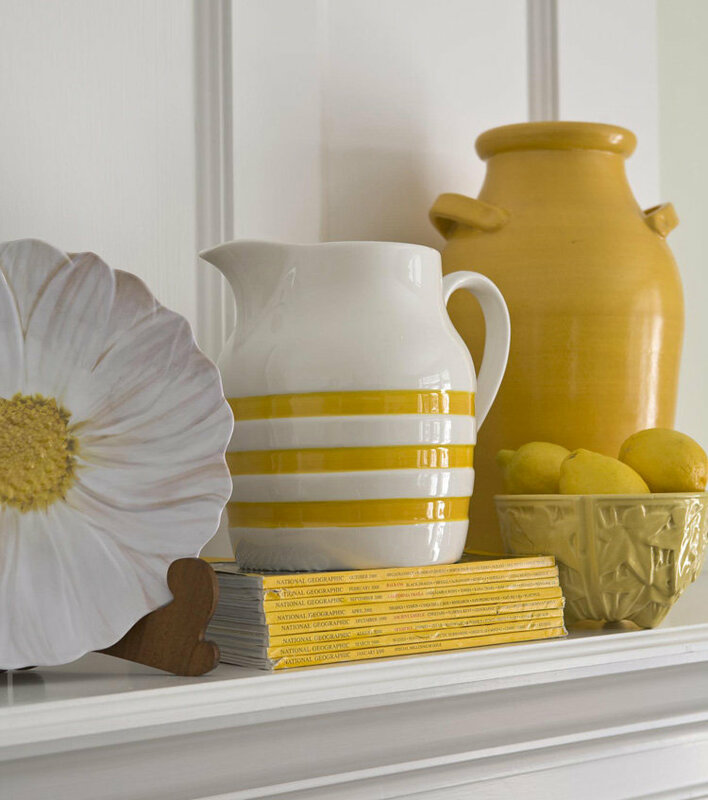 A cheery vignette of yellow is a creative way to create instant sunshine in any room. This cottage kitchen comes alive with modern yellow stools and the always perfect bowl of yellow lemons! Without the yellow pops it would be ordinary. With yellow. Extraordinary! This bedroom is a WOW with the yellow bed and the blue jar filled with yellow posies! Don’t you just LOVE this stunning YELLOW front door!?! Every neighborhood needs a sunny yellow house! If your house isn’t yellow nor your front door, add a pop of yellow with a lemon wreath! What are you inspired to do with yellow? There’s a great SALE every Tuesday & Wednesday at Noon EDT. I love the lemon wreath! We have black eyed susans and sunflowers blooming beside our front porch right now and it really does brighten up the area a lot more than I would have thought. Oh Jean, black-eyed Susans and sunflowers make me smile. 😀 I think they’re perfect for this time of year. Enjoy!!! I so agree. When we bought our house it was a sad blue (actually, I love blue, but this particular shade really DID look sad) and I knew that when we could afford it, it would have to change to a sunny yellow. It’s the only way it’d feel like home. Six years later, we re-sided: yellow with black shutters. I hardly know you Michelle…but a yellow house surely fits you and your cheerful sunny disposition! You do shine brightly! Yellow is bright and sunny, but how about a word or two for blue? Or better yet yellow and blue? Still better yet, MAIZE and BLUE. Time for big ten football! I’m pretty sure I can swing that sometime in the future. 😀 In the meantime I did do a post on BLUE Mason Jars! Hehe! I had to come check out your yellow post….and I’m happy I did! I’m not sure what kind of flower it is that you found (my husband is the plant person in our family), but it is pretty. That bedroom is perfection – from the yellow bed and flowers, to the blue jar, to the old suitcases making up the nightstand. I want to live in it!